Events Business Management Guide from C.H.I.P.S. Working in event planning might be fun, but that doesn't mean running your event company will be a party. This reference is a comprehensive, practical guide to the essentials of running your business seriously, even if your business is all about having a good time. The Special Events Advisor is the only book that offers all the business information creative event professionals need to start an event business and operate it legally, efficiently, and in a totally professional manner. 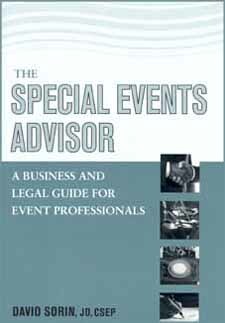 The Special Events Advisor is an impressive work that should be on every event planner�s bookshelf!